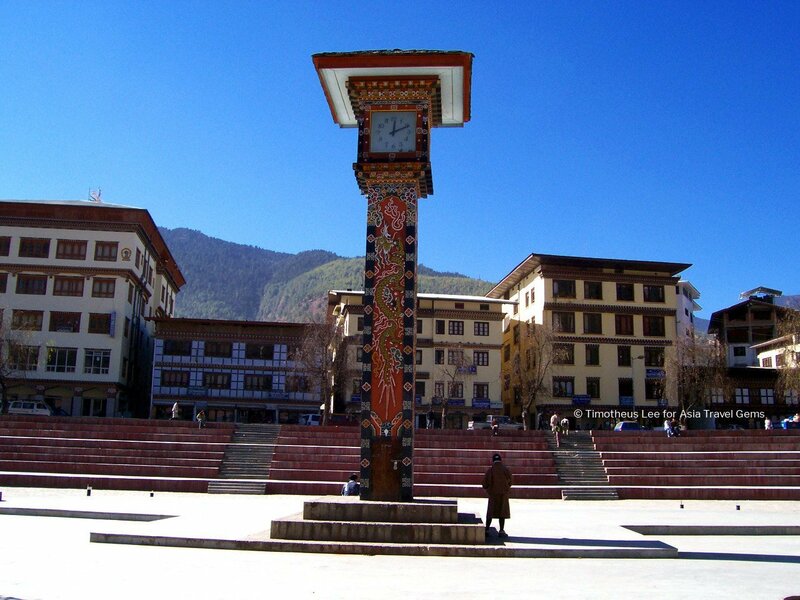 Some may say that Radio Tower Hill cannot be counted as one of the Best Places To Visit In Thimphu Bhutan. But I do find the location very pleasing and definitely worth taking the long and tiring hike up to the peak. 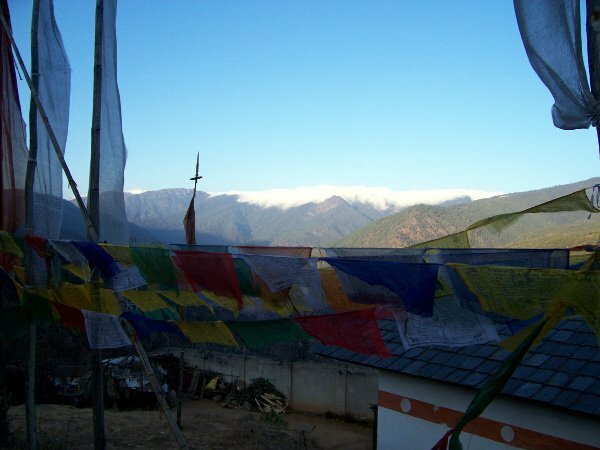 Plus, the hill is where you can find the Takin Preserve, and an awesome view of Bhutan‘s Thimphu valley. I was staying a friend’s apartment and you could see the radio antenna sticking out of the hill from afar. See the photo below, it is circled in red. It was a bright sunny afternoon, and that was to be the goal for my friend and I that day. We were going to take a walk all the way up to the top of that hill. In the above photo, it looked quite near, doesn’t it? In reality, it was quite far away. And made more distant because we had to walk from my friend’s apartment all the way to the top of Radio Tower Hill. Travel Tip: Radio Tower Hill is also where The Takin Preserve is located. 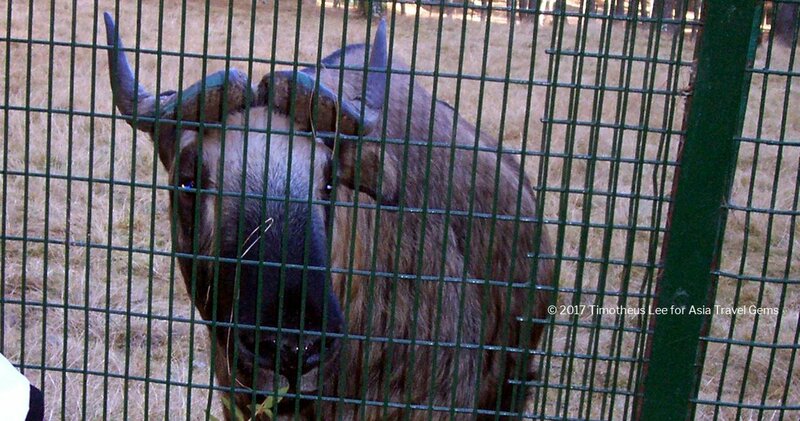 Don’t miss reading my blog post about this special species protected by the World Wildlife Fund. To my friend, who had regularly walked up and down mountains on weekends as part of his regular exercise regime, the trek was no problem. But to me, I was panting in no time. Plus, the thin mountain air made it more strenuous for me. Fortunately, my friend was patient and kind enough to stop and wait for me to catch up every once in a while. In Bhutan, everywhere we went, there were prayer flags. Even in the city area. So naturally, the mountain was no exception. I spotted a long string of prayer flags flapping in the wind. They were strung between very tall trees on treacherous slopes. I wondered how did anyone managed to get the flags up there? I asked my friend in case he knew. He did not but had a few theories. One was that a very strong person climbed one of the trees with the flag. Then another climbed up the other tree that the string of flags would be tied to. With a heavy object (e.g. a large stone) tied to one end of the string of flags, the stone would be thrown across to the guy on the other tree. And … ta da! 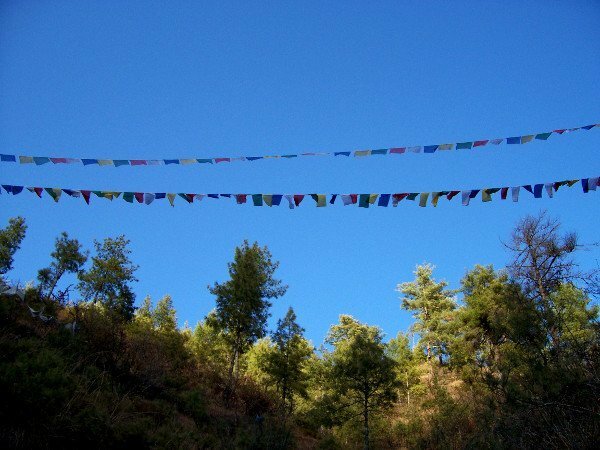 … a string of prayer flags! Credible? If not, here’s the other theory. One person climbed a tree with the flag as well as bow and arrow in tow. The string of flags would be tied to the arrow. The person, most probably a marksman in archery, would shoot the arrow across to the other tree. Another person would quickly climb up, grabbed the arrow, and tie that end of the string of flags to the tree. Ta da! A string of flags! Which one is it? You choose. Higher up the mountain, there were these small white objects nestled along the side of the mountain. I was mystified by these small white objects. They looked like they were made of some form of clay, and looked very delicate. I asked my friend what they were. He explained that they are called Tsa Tsas. 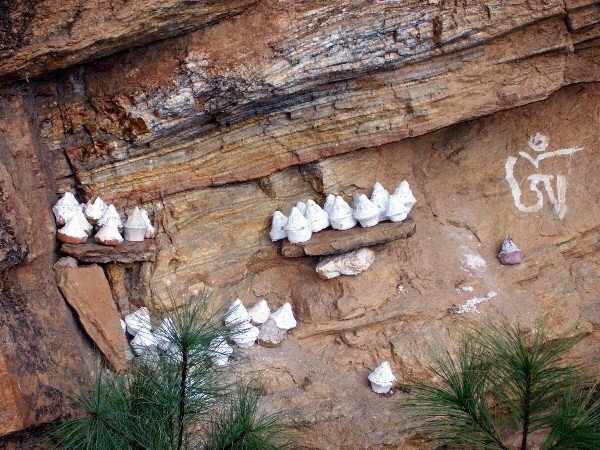 They are made of ashes and clay into a shape of a stupa. Tsa Tsas were made to clear obstacles or negativity in one’s life. Some were made to bless and protect the life force of a person or an entire family. 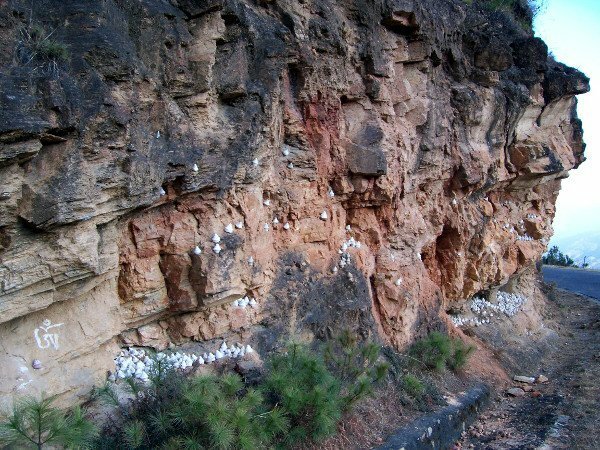 When placed in an area that is high on a mountain, they are there to bless the area, and prevent any disasters. Also, Tsa Tsas are believed to benefit sentient beings, and the world we live in. True enough, the latter was the case. My friend told me that there was a very major accident in that area some time ago. Many people died. The Tsa Tsas were created from the ashes of the people after they were cremated. He also told me that there was a large stupa dedicated to those who died in that tragedy. We came upon the stupa, and my friend advised me not to take any photos of it as it may offend the locals. So, out of respect I did not. 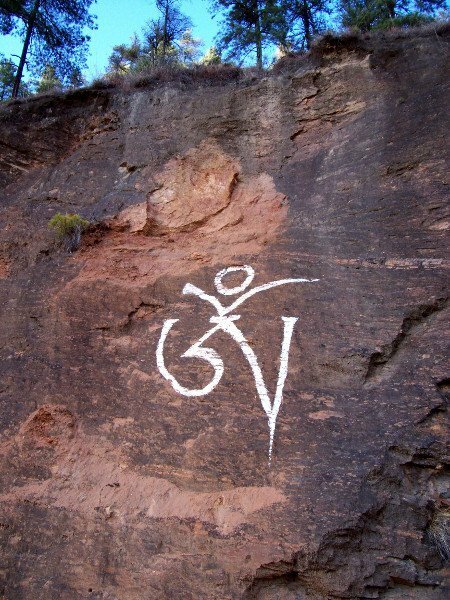 This may be the largest Om symbol in the entire world. It is very large. About 50 meters in height. I wondered how they managed to paint it on the slope of the hill? Finally! We arrived at Radio Tower! I was perspiring and panting by the time I reached the peak of Radio Tower Hill. Yet, I could not resist a photo opportunity. 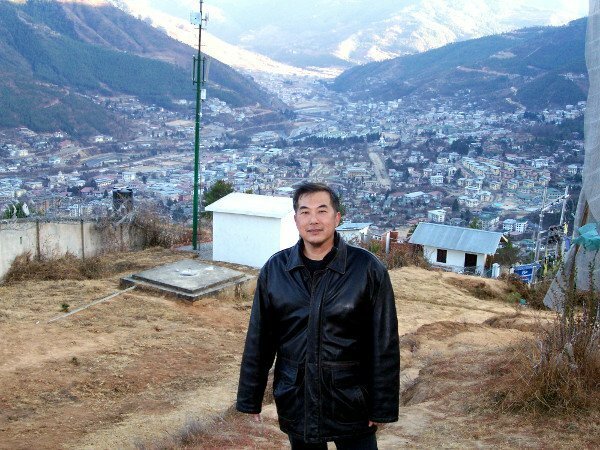 My friend exclaimed ‘Welcome to Radio Tower Hill!’, then pointed to the back of me and informed me that we could see the city of Thimphu from that vantage point. And also said it was a great place to take a photo. So I passed him my camera, and he took the photo above. Isn’t it an amazing sight? 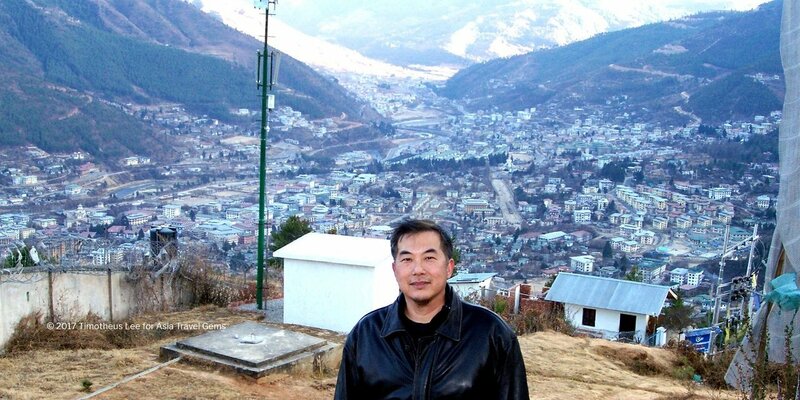 The entire city of Thimphu and the mountains around it? Magnificent! I had to take the next photo below too. I have noticed this mountain for quite some time now. No one seemed to know her name. I decided to call her ‘Rolling Clouds Mountain’ because there always seemed to be clouds continually flowing over her peak. We could have spent hours at Radio Tower. The views on all sides were breathtaking (pun intended). The prayer flags, teased by strong winds, flapped loudly in unison, like an orchestra playing a symphony of a long forgotten song. As the flags twirled in the air, in rich and varied colors, it appeared as if rainbows were everywhere on Radio Tower mountain. It was as if rainbows had come home. 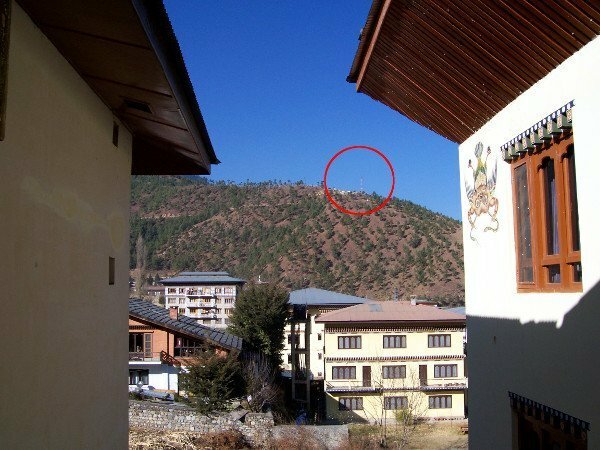 If you have ANY questions about this article, about Best Places To Visit In Thimphu Bhutan – Radio Tower Hill, ANY at all, please submit your questions as comments below. I will be happy to help you out. Thank you for your sharing and look forward to more posts from you, Tim. Welcome Maisur. We’re glad to share this and more. Watch for it. We are working hard on our next blog post. 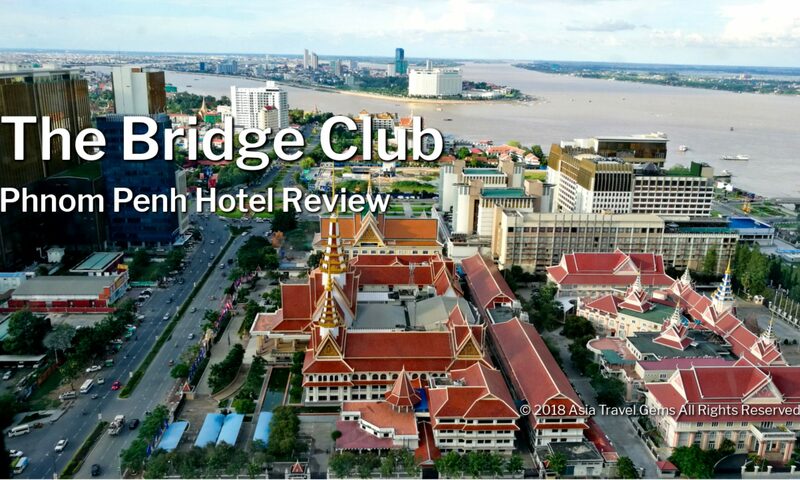 Please do subscribe to our newsletter for updates.